I like to color-code things. I'm otherwise a pretty laid-back gal, I just enjoy playing with color. And food. That's normal, right? I made a stir-fry for dinner tonight using some of the veggies I picked up at the Farmers' Market last weekend, and it turned out that all of the ingredients I used (except for the sauce) were either green or white. I have a little secret that I need to share. I didn't make the sauce, I used a packet from our local Asian market. I doctored it up a bit with some soy sauce, hoisin, rice wine vinegar, and garlic salt. My secret is especially random because the sauce packet was for Spicy Garlic Eggplant. This dish? Clearly not Spicy Garlic Eggplant! It was tasty, but next time I'll go the extra mile and make my own sauce. As with most things I make at Playing House, this recipe is highly customizable. Add, omit, or change whatever makes you happy! Look at these rose-like beauties! 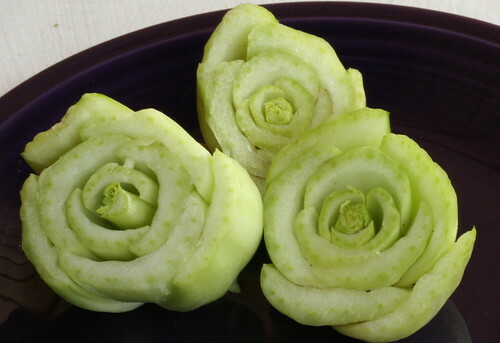 They're the stem end of the bok choy... pretty, right? 1. Heat 2 tsp. of the peanut oil in a wok over high heat. Add tofu and stirfry until golden brown (it took about 20 minutes to get to develop the nice brown crust I like). Remove from wok and set aside. 2. Add remaining tsp. of peanut oil to wok. 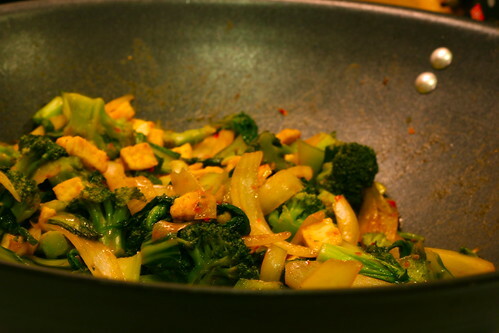 When hot, add onions and stirfry until they begin to soften. 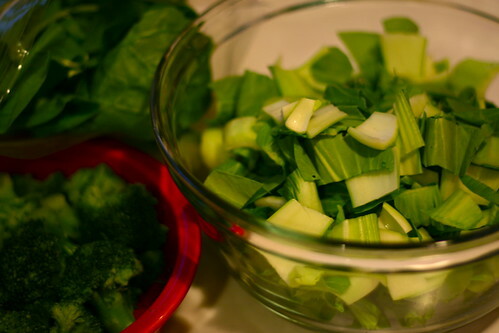 Add in remaining veggies and continue to stirfry for several minutes. 3. 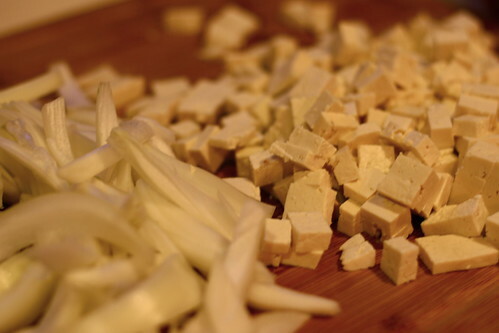 Toss in tofu and add sauce. Let simmer for a few more minutes. Taste and adjust seasoning.